If the big bang were true, the light from the fireball should cast shadows in the foreground of all galaxy clusters. Published in Creation magazine 37(1):50-51, 2015. Update (1/3/2018) I first have made this argument in 2006 based on the work of Prof. Lieu and others. If the big bang were true, the light from the fireball should cast a shadow in the foreground of all galaxy clusters as illustrated below. However new research (Xiao, W., Chen, C., Zhang, B., Wu, Y., and Dai, M., Sunyaev–Zel’dovich effect or not? Detecting the main foreground effect of most galaxy clusters, MNRASL 432, L41–L45, 2013) has thrown this conclusion into doubt. Prof. Lieu at the time wrote “Either it [the microwave background] isn’t coming from behind the clusters, which means the Big Bang is blown away, or … there is something else going on.” As it turns out that “something else” is contamination of the expected shadowing by radio emissions from the galaxy clusters themselves. Without anything to contradict this new result, and the analysis seems strong, one must entertain the possibility that the anomaly first found by Lieu et al in 2006 has been adequately explained. The problem of course is that astrophysics is not exactly operational science. At best this no-shadow argument is now equivocal and hence I suggest that it may no longer be used as an argument against the big bang hypothesis. One of the alleged ‘proofs’ of the big bang model of origins is said to be the Cosmic Microwave Background (CMB). The radiation was discovered in 1964 by Penzias and Wilson for which they won the Nobel prize in physics. Soon after their discovery, it was claimed that this radiation is the ‘afterglow’ of the original ‘explosion’ or fireball of the big bang. Since the time at which the radiation, which started as heat, was emitted from the fireball, the universe has allegedly expanded by a factor of 1,100. Thus, that ‘afterglow’ radiation has ‘cooled down’ to much longer wavelengths (‘stretched’ from the infrared to the microwave portion of the spectrum).1 These are detected by microwave telescopes today. Figure 1: Temperature fluctuations of the all-sky projection of the CMB radiation, after a constant background equal to 2.725 K was subtracted. Darker spots represent cooler regions and brighter spots represent warmer regions. The central red region is radiation from the Galaxy, which needs to be removed before the supposed background radiation can be seen without foreground contamination. How did the universe begin, and how and when was everything in it created and formed? That is probably the most fundamental question of all. Here I compare two cosmogonies (the study of the origin of the universe). A worldview is what we hold to be true, essentially, without proof. 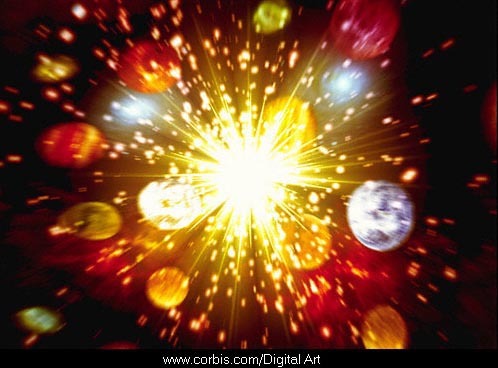 The big bang/evolution worldview and timeline is compared to the Genesis creation worldview and timeline. The problem of initial assumptions is highlighted. In March 2014 a team of astrophysicists announced to the world, through a public press release, that they had made the biggest discovery of the 21st century. 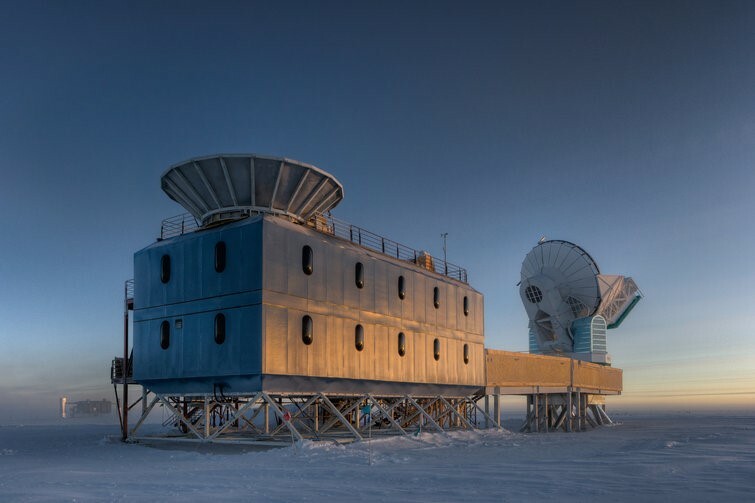 Using the BICEP2, a telescope located at the South Pole they claimed that they had discovered evidence of the early inflation epoch of the big-bang universe. This was in part identified through what they claimed was the signature of primordial gravitational waves generated by distortions in spacetime during the first quintillionth of a quintillionth of a second after the alleged big bang and the effect of gravitational lensing on the B-mode polarization of the CMB photons1 that have travelled for allegedly the past 13.4 billion years since they left the big-bang fireball. The discovery was celebrated worldwide and some even spoke of a Nobel prize for the work. “Astronomers Just Detected the Beginning of the Big Bang”, “Big Bang’s Smoking Gun Found”, “Astronomers Discover First Direct Proof of the Big Bang Expansion” and “Major Discovery: ‘Smoking Gun’ for Universe’s Incredible Big Bang Expansion Found” were some of the headlines on Monday 17 March 2014 around the web-based news media. Radio astronomers operating telescopes at the South Pole said Monday that they’ve discovered evidence that the universe ballooned out of the Big Bang due to a massive gravitational force generated by space itself. The discovery is being called the “smoking gun” for the Big Bang theory, and it could have huge implications for our understanding of our universes [sic] (and possible others). Harvard-Smithsonian astrophysicist John M. Kovac and his team detected gravitational waves—tiny ripples in the fabric of space—that could be the first real evidence for the ‘inflation’ hypothesis of how the universe basically bubbled into being nearly 14 billion years ago. The discovery also suggests that our 14 billion light-years of space aren’t all that’s out there—our universe could be a tiny corner of something much, much bigger. Saved by a false gospel?